There is a Birthday to celebrate today, its the birthday of Sean Lobban (aka The Amazing Mister Tall). Sean is a balloon modeller and I have ballooned with him on many occasions. To help celebrate Sean's birthday I have made Mr Tall from the Mr Men books, Happy Birthday Sean. 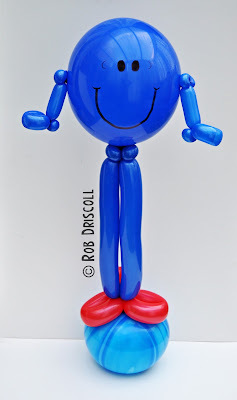 Mr Tall here is made 5 balloons, I made his body first from a round balloon and put in 2 raisin twists for the arms which are a 160, the legs are also a 160 and are joined onto the knot in the round balloon, his feet are a 160 and the base is a sand filled round balloon.